Abbey Brewer, is a seasoned yoga teacher (actively teaching yoga since 1998) who has many certifications that include E-RYT 500, RPYT, YACEP, LMT, CNMT, Comprehensive Certified Pilates Instructor, certified community and family herbalist and certified aromatherapist. 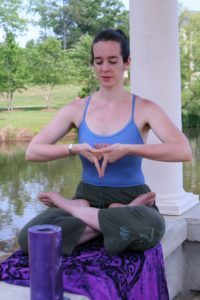 She is the founder and director of Georgia’s first registered prenatal yoga teacher training school and has taught and apprenticed with women’s health PT, Candice Goch for over a decade. She has been supporting individuals in holistic health options for over 19 years, working as a yoga teacher, neuromuscular therapist, licensed massage therapist, doula, fertility, pregnancy, and postpartum specialist, offering abdominal detox massage, & herbal support. In addition to her work in full spectrum health, she taught musculoskeletal anatomy, neuromuscular therapy, and rehabilitation at Rising Spirit Institute/Gwinnett College for more than 8 years. She has designed anatomy programs for both yoga and Pilates teacher training programs throughout the state of Georgia. Her goal is to mentor students through education and movement practices so that we can all be self empowered, vibrant, and ultimately thrive.